Last week I was talking to another deacon. He mentioned that for the Year of St Paul, he was making an effort to preach only on the Epistle reading. I though this was a neat idea, that I should try on my own homilies. I went home and took a look at the homily I had already started. I had to admit in light of the financial troubles our nation is suffering, what I had prepared did not resonate with me all. So I took my friends advice (He is a theology college professor so I always follow his advice :-)and took a second look at the Epistle reading (In fact I took a look at the whole Letter to the Philippians for context) and that was it, all the parts just fell in place. The most amazing think is that I usually spend 8 to 10 hours preparing for a homily but this time it only took me two hours, from first idea to final product! 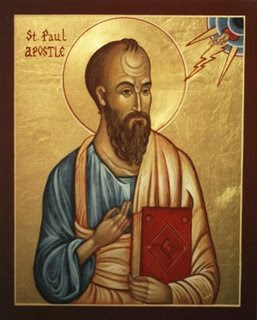 I pray to the Lord that the words of St Paul are a source of great consolation to you. This past June Pope Benedict 16 announced the beginning of a special year dedicated to the Apostle Paul. During this time Catholics are encouraged to remember this great apostle and to study and reflect on his writings. Usually in my homilies I focus in the Gospel, However since this is a special year, I have made a point to seek for opportunities to preach about the letters of this great apostle. So while getting ready for today, I was astounded by the second reading, in fact my surprise became even greater when I discovered that in a period of 5 weeks, this year, we will get to read the whole letter to the Philippians! (You might be thinking “men if the deacon gets excited about this sort of things he really needs a hobby”) But I ask you to bear with me in the hope that at the end of today’s homily you will see what I’m talking about. Before we proceed I need to give you a bit of background about the Letter to the Philippians. Paul wrote this letter while imprisoned in Rome, we know that he had been under house arrest for 2 years, and he makes very clear that he knew he was going to be executed soon, so by the time he wrote this letter he had at the least the suspicion that his career as an apostle was coming to an end and it is clear that he had come to accept this fate. You can say that this is an “end of life” letter. You can see that in this letter, all the fiery rhetoric of his previous works is gone. What is left is Paul the man, reflecting on a life dedicated to spreading the Gospel. He has seen much, he has suffered greatly, and now, as he awaits his fate, he advices us about the most fundamental aspects of life, those things that in his experience are most important in the life of the believer. You might be wandering, why is all this significant to us today? Well because as it also happens for the last few weeks our country has been suffering from the deepest financial crisis in memory. I’m sure some of you can relate to the story of a dear friend of mine. He was telling me that since this crisis started they have lost most of their retirement fund and the money they had invested to send their children to college is disappearing right in front of their eyes. Their family is afraid, angry and confused. For them, their future, all the plans they had, all their work for the last 20 years is gone, evaporated in just a few weeks. On top of that they are worried about the direction our country is headed and about what kind of world their children will inherit. Now, the reason for my surprise when I was preparing for this homily is based on the simple fact that I do not believe in coincidences. I do not think that things happen by chance. I do not think that it is just a fluke, that our Holy Father back in June decided to encourage us to look deeper at what St Paul has to teach us, and I do not think is a coincidence either, that the economic catastrophe our country is suffering is happening precisely during the only five weeks in the liturgical calendar in which we read the complete Letter to the Philippians, which by the way we will not read in this way until the year 2011! By now, you might be thinking what can possibly Paul have said that will shed light upon the serious problems we are facing today? “My God will meet all your needs according to his glorious riches in Christ Jesus. Amen”…My brothers and sisters I have nothing else to say other than sometimes we should just let scripture speak to our hearts. Deacon Harbey, I just had a chance to revisit your homily...which when heard was great, and now read means even more. Thanks for making the point of how scripture is so beneficial... and St. Paul's message is so true!